The Institute of Chartered Accountants of Sri Lanka (ICASL) recently organized a felicitation ceremony to honour employees who had completed 25 years of service. 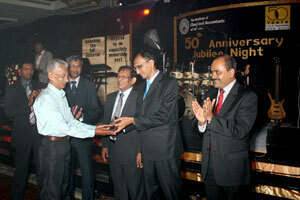 Thirteen retired employees and 15 others still employed at the ICASL were felicitated. It was organized by the ICASL to recognize their valuable services for the betterment of the institute. “The sweat and blood of these employees helped the institute to attain its present heights. Hence, it is our responsibility to respect them,” ICASL, President, Nishan Fernando said in a statement. “We organized the felicitation ceremony to mark the 50th anniversary of the ICASL. As part of the celebration, the council of the ICASL decided that these employees be felicitated in a fitting manner. They have been invaluable assets to our institute for the past 25 years,” said Chairman, Golden Jubilee Celebration Committee of ICASL, Lal Nanayakkara, on the occasion. ICASL is a globally recognized accountancy body and its qualification has gained wide acceptance all over the world. ICASL was the first professional Accountancy Organization to be incorporated under an Act of Parliament. It has been conferred the sole authority of formulating accounting and auditing standards in Sri Lanka. During its 50 years it has discharged its professional responsibilities in an exemplary manner consolidating the confidence reposed in it by the stakeholders, the statement added.